Two Former State Attorneys General Arrested In Utah : The Two-Way The former chief law enforcement officers face 23 counts of bribery, obstruction of justice and other charges. Utah Gov. Gary Herbert calls it "a black eye" for the state. 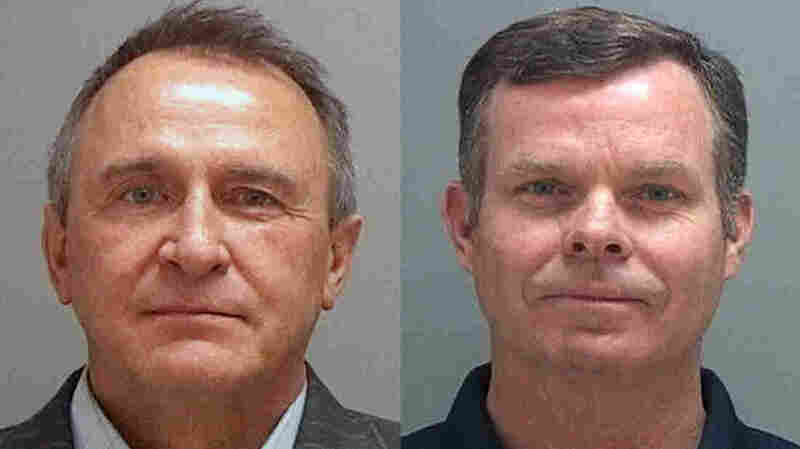 Former Utah attorneys general Mark Shurtleff (left) and John Swallow were taken into custody Tuesday as part of a bribery investigation. Two former Utah state attorneys general were arrested Tuesday. Both face numerous charges, including receiving and soliciting bribes. Mark Shurtleff served as attorney general for a dozen years before completing his third term at the beginning of 2013. John Swallow was elected to succeed him but resigned in November, less than a year into the job. Both are Republicans. On Tuesday, Swallow was charged with 11 felonies and two misdemeanors, including accepting bribes, tampering with evidence, misuse of public funds and obstructing justice. Shurtleff faces 10 counts on similar charges. They could each face 30 years in prison. "This is a sad day for Utah," GOP Gov. Gary Herbert said in a statement. "The entire situation, regardless of how the legal process plays out, is a black eye for our state." The two men have been the subject of multiple investigations, including a $4 million probe by a special state House committee. Its report found that Swallow "compromised the principles and integrity of the office to benefit himself and his political supporters" and that Shurtleff "sold out" Utah residents. "We have filed what we think are appropriate and minimal charges," Salt Lake District Attorney Sim Gill said at a news conference Tuesday, according to The Salt Lake Tribune. "We could have filed more, but we chose at this time to just file what we did." Gill, who is a Democrat, denied any partisan motivation. The complicated case centers on the relationship between Swallow and Shurtleff and various businessmen. They are accused of using, on multiple occasions, a private jet, luxury houseboat and Ferrari belonging to a man named Jeremy Johnson, who has been indicted on 86 federal charges of fraud. According to the Deseret News, investigators have also examined their relationship with another wealthy businessman, Marc Sessions Jenson. Jenson is serving a 10-year sentence on securities fraud and has accused Shurtleff and Swallow of extortion. On a 2009 recording that surfaced last year, Shurtleff is heard saying he believed he could get $2 million from Jenson to silence an investor. The "drumbeat had been building" that the former attorneys general could face serious charges, says Christopher Karpowitz, a political science professor at Brigham Young University. "It's always shocking if the two previous chief law enforcement officers of a state are arrested," Karpowitz says. "When a scandal of this magnitude hits the state, that is both shocking and sad."